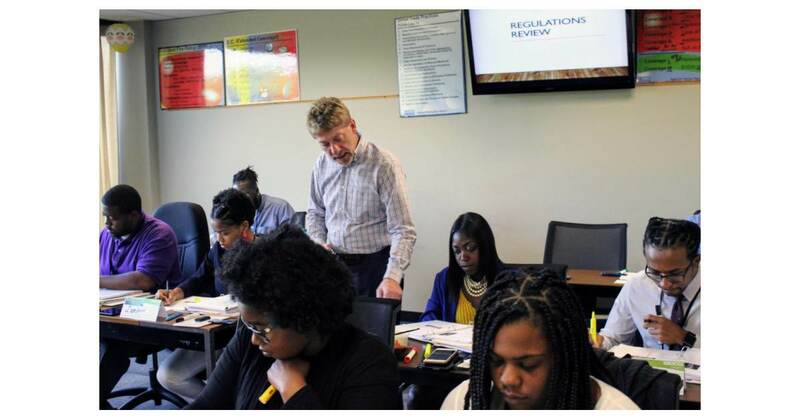 MACON, Ga.–(BUSINESS WIRE)–As a senior licensing instructor, Chris Orrison helps GEICO associates obtain the certifications and licenses they need to serve customers. In that role, he’s developed an uncanny knack for explaining complex insurance issues; it’s a reputation that has spread beyond the walls of GEICO’s Macon, Georgia, regional offices. Orrison has been an adjunct continuing education instructor at Central Georgia Technical College (CGTC) since 2012 and recently started teaching business credit courses. This fall, he’s expanding his teaching duties with a position on the adjunct faculty at Mercer University, one of the top-ranked schools in the Southeast. “I keep classes engaging by telling lots of stories from my experiences in the industry and by always reminding people that insurance and risk management are all around them, from the cart corrals at the grocery store to the net behind home plate to the liability policy of their favorite restaurant,” Orrison said. Orrison’s interest in teaching at the collegiate level was sparked after he joined CGTC’s Board of Trustees on GEICO’s behalf. He initially hit a roadblock because like most colleges, CGTC requires faculty members to hold at least a master’s degree. Undeterred, Orrison began taking classes himself, eventually earning his MBA in 2017. “When I thought about teaching outside of GEICO, CGTC and Mercer were at the top of my list. It’s hard to believe they both gave me the opportunity,” he said. Orrison is teaching “Intro to Risk Management and Insurance” at Mercer, which, for the first time, is offering a risk management/insurance track in its business school. Orrison said students are pleasantly surprised to learn that the insurance industry is about much more than premiums and policies. “Once they get exposed to the different facets of industry – things like smart systems, the math behind the pricing and the different marketing messages – they realize it’s more exciting than they first thought,” he said. Orrison, too, grew to love the industry. More than 33 years ago, he was working at a Frederick, Maryland, gas station when he was encouraged to apply at GEICO by his mother, who had worked at GEICO during the company’s infancy in the 1940s. He was hired onto the sales team and worked in several underwriting capacities at GEICO headquarters in Chevy Chase, Maryland. He transferred to GEICO’s Macon operations in the 1990s, and while working his way up to supervisor, Orrison taught himself insurance licensing courses. He eventually began to teach other associates and transitioned to a full-time position as a licensing instructor. Orrison said the most rewarding part of teaching is seeing the light bulb switch on, as his students go from confusion to comprehension. A lifelong learner, Orrison gets an A+ in time management. In addition to balancing his full-time job at GEICO with two adjunct teaching positions, Orrison is also preparing for his November wedding to Melissa Hardman, a full-time CGTC faculty member.